The Rio Grande Valley is a name given to a region of far south Texas, just before the lower Rio Grande flows into the Gulf of Mexico. Initially a farming area known for citrus production, it has evolved into a favorite, low-cost destination for Northerners to spend a comfortable winter. All along Interstate 2, the orange and grapefruit groves are slowly being pushed aside by shopping centers and RV parks. Beyond the orchards, stores, and RV parks, the Valley area is also home to poverty on a large scale. Developers have bought up tracts of land and will gladly finance the subdivided lots, with interest rates around 15%. Their customers have few alternatives, since most of them have come to the area without a lot of regard for the formalities of legal immigration. These subdivisions, with few (if any) amenities – such as water or sewer service – are usually called colonias. 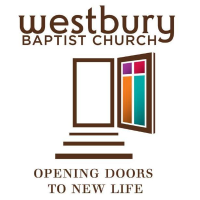 For the last two summers, our church -- Westbury Baptist Church in Houston -- has planned trips to do service projects in a small mission church that serves one of those areas. Vino Nuevo is a small mission in the optimistically named “Goolie Meadows." “Goolie Scorched Barren Plain” would be more accurate, especially in mid-July. Roads leading around the area range from “narrow, but okay” to “more potholes than actual road." All that said, Goolie Meadows is probably one of the better colonias in the area. Carol (my spouse) and I towed our trailer down to one of the RV parks that we knew well: Trophy Gardens, in Alamo. In the 1980’s, my parents had wintered at Trophy Gardens when it was a new park, with the paint still drying here and there. Trophy Gardens is one of those full-service RV parks that hits its stride in the dead of winter, with RV’ers coming in from all over the U. S. and Canada. So, naturally, in mid-July it was a ghost town. Trophy is still a well-kept park, with a 24-hour gated entrance year round. There are a few dozen year-round Trophy residents, most of whom were curious about why anyone would just come down to the Valley in the summer. 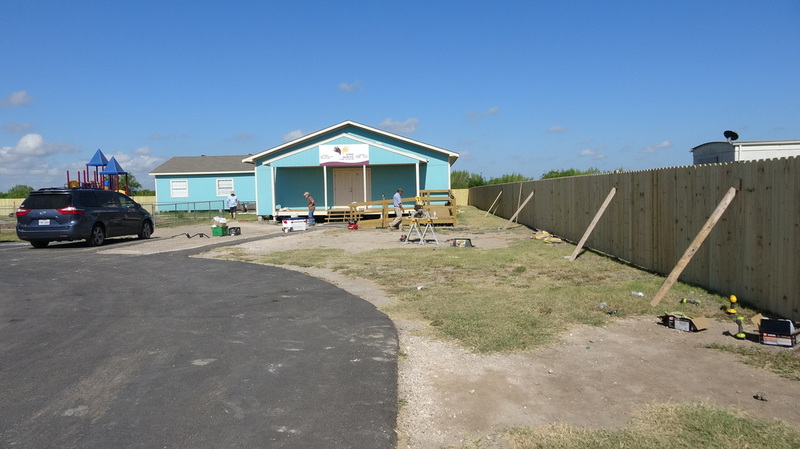 Last summer, our church had several service projects going on at Vino Nuevo: Building a substantial wheelchair ramp, painting and caulking, installing soffits under the eaves, and so on. Temperatures ran around 100F every day, and there was no air conditioning at the church. The mood was lightened by a neighborhood boy, 13-year old Jonathan, who was very proud of his church, and was very optimistic about his future. Jonathan wanted to know all about building the ramp. He soon became expert at hammering nails, drilling holes, and driving wood deck screws. Jonathan proudly pointed out his house, or, well, “two houses,” as he described it. What we saw was an ancient, 22-foot camping trailer, with a small shed built off to the side. The shed had window openings, but no actual windows mounted in the openings. When the 2016 mission project was scheduled, we were happy to find out that we would be back at Vino Nuevo. The intervening year had brought air conditioning to the mission – a service project from another church. Yet another mission project had installed a basketball court with a cement floor. In addition, Vino Nuevo had started another mission in the area. 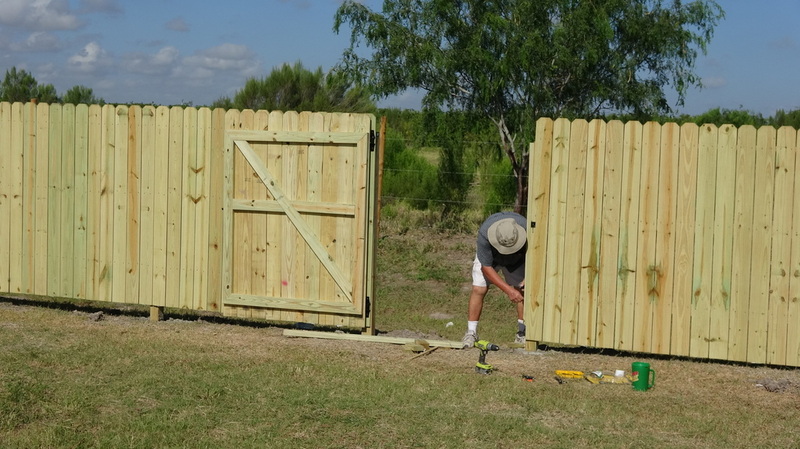 This year, our church’s project was to install about 200 feet of wooden fence across the back of the property. Also, there was some painting, installing flooring, and putting burglar bars on the back windows. We also heard that 2015’s main project, the wheelchair ramp, was used not only by wheelchair-using church members, but also by the neighborhood skateboarders, too. Not exactly what we had in mind, but if it gets them to church. . .oh, well. We began the fencing work on Monday, and quickly found that the post hole digger needed serious upgrading. We rented a bigger model, then drilled post holes steadily Monday and half of Tuesday. 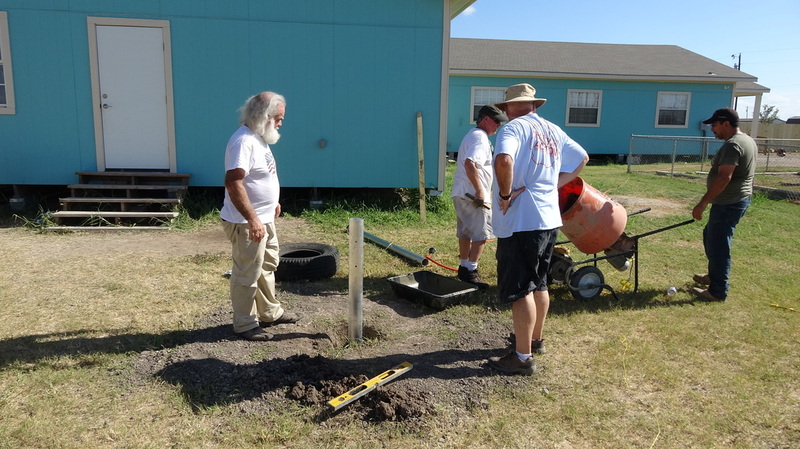 When we saw how fast the drilling was going, we consulted with the mission’s pastor, and doubled the fence length. Verdict: Another 200 feet, running from the back of the church’s property out to the street. Five days of sweat, sunburn, splinters, and wood screws followed. One worker from last year was conspicuously absent: Jonathan. His home now looked abandoned, so I asked some of the mission church members working with our building crew if anyone knew anything about him. No one did. One church member surmised that his family had migrated north for a job opportunity and had stayed there. Meanwhile, we marched down the line, setting posts, fastening the horizontal runners, and putting up pickets. Painting, flooring, and other projects were going on inside the mission building. At about 10:30 on Friday morning, the last picket went up and all of us went back to our quarters to get cleaned up. Friday night, the church had planned a block party for neighbors and church members. The people were enthusiastic, Pastor Ivan De Leon was dynamic, and the gospel music was positively rocking. I couldn’t understand a word being sung, and very few of the words being spoken. The crowd, however, was singing along at the top of their lungs – no hymnals needed. As the party wound down, I took a minute to ask Pastor Ivan if he knew what had happened to Jonathan’s family. I needed a little help, since Pastor Ivan’s English was limited, but with his brother Felipe translating for us, I found the answer to the question that had gnawed at me all week. Jonathan’s family had hit some hard times and weren’t able to make the payments on their lot. The family had lost their property, but some of the local churches had banded together and found another place for them to live, but it was not near Vino Nuevo. Not the happy ending that I had hoped for, but at least I had a better idea what had happened.